Clarkston, MI – One of my favorite breakfasts ever is at Royal Diner at 6540 Dixie Highway, Clarkston, MI 48346. I am in love with their Garden Crepes. 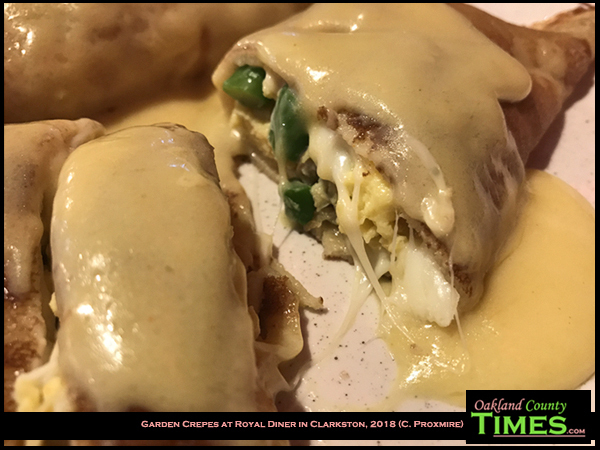 These are deliciously thin, rich crepes stuffed with scrambled eggs, mozzarella cheese, mushrooms, tomatoes, and asparagus, and topped with hollandaise sauce. Royal Diner is a very casual place with inexpensive prices. And they’ve got a variety of meal options. 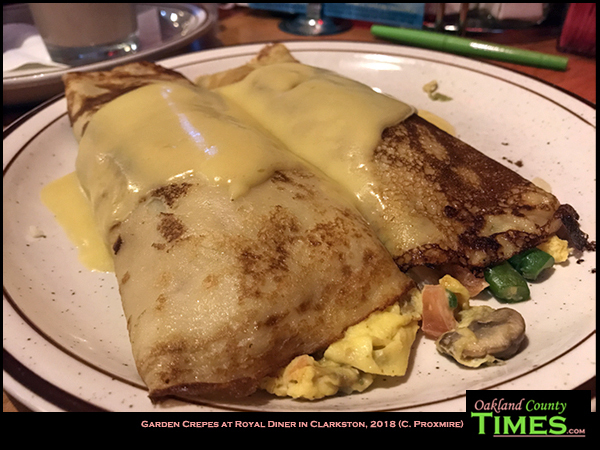 There are a lot of breakfast options, including fruit crepes, chicken Florentine crepes, biscuits and gravy, omelets, and even Monte Cristo sandwiches. For lunch and dinner there are salads like the Napa Valley Salad, Seafood Salad and Grilled Salmon Salad. There are burgers, hoagies, ciabattas, pitas, “south of the border” favorites and a slew of corned beef sandwiches. For more Reporter Food columns HERE.